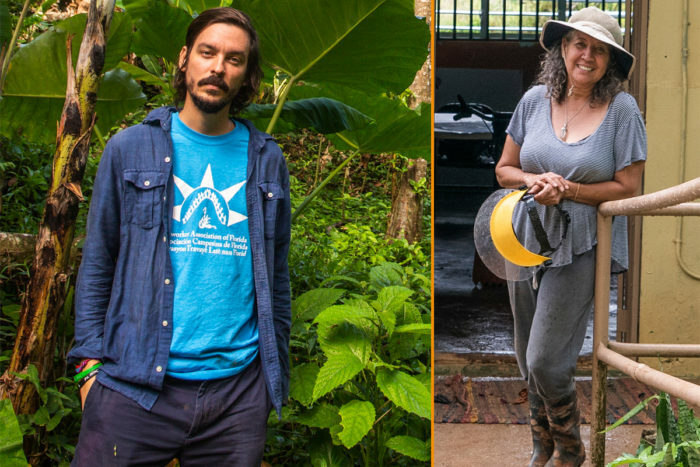 Two members of Organización Boricuá, which recently won the Food Sovereignty Prize, discuss lessons learned from organizing on the front lines of climate change. Even before Hurricane Maria devastated the island back in September 2017, Puerto Rico already imported 85 percent of its food. Local farming declined decades ago amid U.S.-led industrialization on the island, following a shift away from diversified small-scale farms to plantation agriculture. An ailing economy, austerity, and the fact that 44 percent of Puerto Ricans lived below the poverty line all deepened household food insecurity. Facing a non-response from the federal government after the hurricane, residents joined forces to support one another and rebuild. 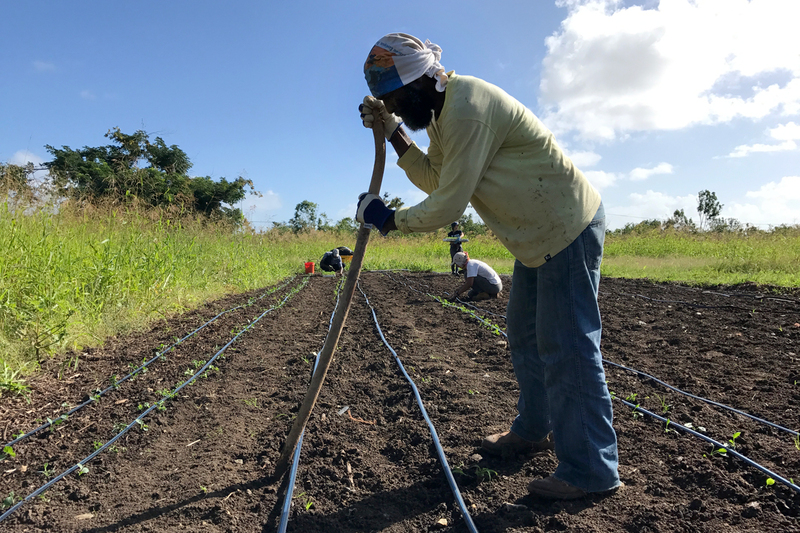 And as part of the larger effort to restore Puerto Rico’s decimated farmland, some advocates have spent the last year helping vulnerable farmers become more resilient to future climate-fueled disasters. Organización Boricuá de Agricultura Ecológica de Puerto Rico, a 28-year-old grassroots farmer and activist group, has led the charge. With an estimated 80 percent of the island’s crops wiped out, the group mobilized support brigades to assist food producers and used a grassroots, farmer-to-farmer approach to share knowledge about agroecological farming and food sovereignty. The brigades organized volunteers to lend a hand to farmers in need, turning fields and gardens into hands-on classrooms and a spaces for social and political dialogue. Against the backdrop of and an uncertain death toll, which the government eventually raised to nearly 3,000, limited communications, and a blackout that lasted for months, they planted fresh crops, cleared fallen trees, opened roads, and rebuilt homes. And their effort is ongoing; after more than a year of slow reconstruction, tens of thousands still lack reliable electricity and adequate housing. For the organizers behind Organización Boricuá, Maria also illuminated the challenges and inequalities of Puerto Rico’s relationship with the United States. On the heels of a U.S. fiscal control board rolling out privatization and austerity to manage the island’s crippling $120 billion debt crisis, the U.S. government’s failure to effectively mobilize federal resources for disaster relief after the hurricane have become the new symbols of Puerto Rico’s colonial bind. In response, Organización Boricuá promotes sovereignty from the fields. Civil Eats spoke to two Organización Boricuá members—Dalma Cartagena and Jesús Vázquez—at last week’s U.S. Food Sovereignty Alliance national assembly in Bellingham, Washington, where the group won the Food Sovereignty Prize The prize, created as an annual alternative to the World Food Prize and its celebration of market-driven responses to global hunger, spotlights national and international honorees who model and inspire grassroots solutions that democratize and transform the food system. The conversation below has been translated from Spanish, and edited for clarity and brevity. What have been Organización Boricuá’s most important successes or impacts over its nearly three decades of work? Jesús Vázquez: One of the biggest achievements has been organizing farmers, agricultural workers, peasants, activists, and educators—[bringing] people from different areas together for a more just, resilient, sustainable kind of agriculture, which for us is agroecology. We see agroecology as our tool of struggle to achieve food sovereignty. What are the greatest challenges of working to advance food sovereignty in Puerto Rico and how have they changed since Maria? Dalma Cartagena: I think the issue of education continues to be a challenge. Political training on the foundation of agroecology is also a challenge, which has become clearer after Maria. It’s about understanding that we have the capacity to be self-sufficient and produce our own food—healthy food—with fair processes for all, not just for human beings but also for the land, rivers, air, plants, and all biodiversity. We have to be aware that we are part of an agroecosystem. Raising this awareness within and beyond the organization in Puerto Rico is a challenge. Has the Hurricane’s devastation opened up new possibilities to promote and advance sustainable farming? Vázquez: In addition to the bad it brought us, Hurricane Maria also opened our eyes. Especially for those whose eyes weren’t very open yet, caught up in the routine of trying to survive. We have a direct relationship with the United States, supposedly one of the most biggest powers in the world. How can it be that it treats us this way? How can it be that the money FEMA collects [in part from Puerto Ricans] to do recovery work benefits North American companies in Puerto Rico and not Puerto Rican projects, organizations, institutions, or the Puerto Rican government itself? The crisis makes our colonial context more evident. Despite the fact that we lost lives—which we should never hide, like the government did—we have to recognize that it is also an educational experience. And in our sector of agriculture, agroecology, and food sovereignty, we have reflected a lot; we are preparing ourselves better, and we have realized that the best thing is the grassroots. Have you been able to work on new projects, new solutions? Vázquez: First of all, Maria was gigantic. Maria hit us diagonally from the southeast to the northwest with a perimeter almost as big as the island, with a lot of force. We started doing what we know, which is the support brigades. But we are in a reflection stage within the organization to formalize our processes. The committee on education and activism, for example, is working on a formal agroecology school. The organization also created a process of local certification [English translation here] that tells USDA Organic there is a different way. We want to carry out the inspections ourselves in our own way, listening to peasant farmers regardless of whether they are agronomists or not. And the farmer support committee, which manages the brigades, continues projects within the organization, but also for people, projects, or other communities that ask for help. The organization goes to the farmers [to help them in their fields]. Why did the support brigades start, who benefits, and what are their short- and long-term goals? Vázquez: We say the brigades are Organización Boricuá’s organizing and educational methodology. We are a grassroots membership, and we have members in different regions of Puerto Rico. The brigades are open to the public in general, not just members. Some people join and go to an agroecological farm for the first time, and a relationship of solidarity between producer and consumer starts. The brigades offer a way to reach new people. They also offer support to farmers who are behind and need help. Thirty people arrive, many of them with experience in agriculture, and the work it would have taken the family one month to do gets done in one day. The work moves forward, it’s a space for reflection, discussion, a workshop—it has an educational function. And it is replicated from place to place. For us, brigades are a methodology to massify agroecology. Dalma, you’ve been teaching children about agroecology for nearly two decades. What does that look like? Cartagena: I start with children who are 8 and 9 years old. And the children learn all the skills related to producing healthy food through agroecological practices. They learn compost-making, about using plants that can improve soil quality, like legumes, about the use of ground cover, planting different vegetables, and Puerto Rico’s staple products. And the curious thing is that as they learn they become teachers. Once they learn one of these skills, they apply it not only by doing it but also by teaching others to do it. We’ve touched thousands of children over the last 18 years who have learned these agroecological production skills, and many have chosen professions related to agroecology. It’s extraordinary. Children say that when they are close to the land, they feel like heroes that no one can hold back. These are words I have been hearing repeatedly over the years. They feel they are bringing something new to the world. Our hope is for this to be replicated in every school; the right to know how to produce healthy food should be a fundamental human right. This skill needs to be in our hands and in our memory. Do you think this land-based education can build a different future for Puerto Rico? Cartagena: When we lose our relationship to the land, we lose everything it brings us. [Land] gives us peace, power, happiness, sensations of abundance, and all of this is lost—robbed!—from children who don’t have this opportunity. If you cut off that relationship, you have a human being oriented toward death, and not toward life. How might agroecology in Puerto Rico mitigate the impacts of the changing climate? Vázquez: Scientifically, we know that agroecology cools the planet. In Puerto Rico’s case, it represents resistance and resilience. Resilience in the agroecosystem, and resistance because when we talk about agroecology, we’re talking also about social justice. The founding members of Boricuá realized that we can’t do it alone; we have to be organized. It offers space for resistance and transformation. Legally we are a North American territory. We have a colonial context. Agroecology is a tool to exercise our sovereignty on the land. What’s more important than that? If we manage to expand this movement, it will become easier to overcome other challenges. Working the land, watching seeds germinate, and reaping the satisfaction of a successful harvest are more political than any book we could read. What can other food sovereignty and environmental justice movements learn from the experience of Puerto Rico at this moment? Vázquez: The hurricane put agroecology to the test and we had positive results. We have several colleagues with farms who have told us how, through years of practices like crop rotation, intercropping, incorporating organic matter, ground cover, they managed to preserve the topsoil [through the devastation of Maria]. That’s gold. If water doesn’t take the topsoil away, I have somewhere to plant seeds the next day. We had farmers who had landslides, but in their fields they didn’t suffer erosion. There were even some farmers who managed to have some crops withstand the hurricane. Some farmers with yucca, for example, a root below the ground, cut the stem so the wind didn’t take it away, leaving just a bit above the ground. Water and wind passed over, but the yucca was still there, and the next day they were able to harvest and provide food for the community. It was these agroecological practices that allowed us to eat and to recover more quickly. Without a doubt, agroecology is better in the face of climate change. We’ve also learned a lot about renewable energy and we’re working on becoming less dependent on state energy resources. We have some projects that already had their systems in place and we have seen results, and other projects that have started developing their systems due to the experience of the hurricane. We also talk a lot about mutual support. It’s very important. Aside from the technical and practical sides of how the agroecosystem can withstand a hurricane, how we can have energy, and how we can harvest rainwater, there’s the social part and the issue of mutual support. International solidarity is essential especially in the context of climate change. This article has been updated to correct the date that Hurricane Maria made landfall in Puerto Rico. This is a very encouraging article. We get very little news of what is happening in Puerto Rico. Agroecology is the way out of this problem and on to food security as it was in Cuba. It also will steadily reverse the amount of carbon in the atmosphere and reduce the risks of these terrible weather events. The results achieved in Puerto Rico can also benefit farmers in similar ecosystems through an exchange, farmer-to-farmer, of ideas and techniques. Thanks Cartagena and Vasquez for this Interview that in itself is Education.